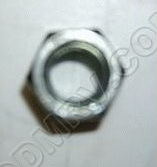 4 Flat Trailer End Plug SKU2912 - $1.99 : Out-of-Doors Mart!, More Airstream Parts on-line than anyone! SKU2912 Quality electrical for Rv or Marine use. 12 in wire.